Mindfulness has been described as a state of awareness characterized by refined attentional skills and a non-evaluative attitude toward internal and external events. Recently, it has been suggested that higher levels of mindfulness may be beneficial in the workplace and first programs aiming to increase mindful awareness in occupational settings have been introduced. The current study underpins these developments with empirical evidence regarding the involved psychological processes, by investigating the relationship between dispositional mindfulness, work engagement, and well-being in 299 adults in full-time employment. As hypothesized, the results confirm that self-reported mindfulness predicts work engagement and general well-being. Furthermore, these relationships are mediated by positive job-related affect and psychological capital (hope, optimism, resiliency, and self-efficacy). Investigating mindfulness and psychological capital as multi-faceted concepts by means of structural equation modeling yielded a more precise picture. The ability to step back from automatic, habitual reactions to distress turned out to be the mindfulness facet most central for predicting work engagement and well-being. Furthermore, mindfulness exerts its positive effect on work engagement by increasing positive affect, hope, and optimism, which on their own and in combination enhance work engagement (full mediation). Well-being, on the other hand, is directly influenced by mindfulness, which exerts additional indirect influence via positive affect, hope, and optimism (partial mediation). Although exploratory in nature, the results identify non-reactivity and non-judging as important mindfulness skills in the workplace. Reb, J., Narayanan, J., & Chaturvedi, S. (2014). Leading mindfully: two studies on the influence of supervisor trait mindfulness on employee well-being and performance. 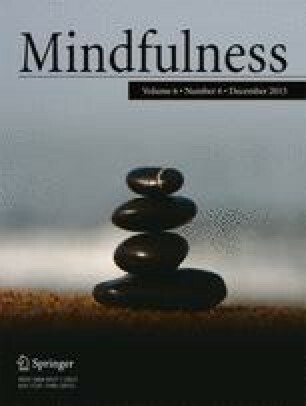 Mindfulness, 5, 36-45. doi: 10.1007/s12671-012-0144-z.